As we are coming towards the end of term, children have been revisiting topics of Ecology and Plant Nutrition/respiration in plants as well as many other areas. Display posters were created which involved diagrams and pictures showing the part that flowers play in the life cycle of flowering plants. 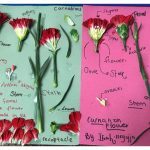 By the end, the children were able to demonstrate understanding of the process of seed dispersal, the processes of pollination, fertilisation and germination as well mention the different stages of the life cycle of a flowering plant.